The westernmost point of shoreline of the Atlantic Ocean is not reachable by bridge. Cumberland Island stands rugged and wild, made of marsh, mudflats and tidal creeks. It is home to a band of wild horses, mangy and muscular, a remnant of the Spanish Conquistadors. Feral, they roam the beaches and the tall grasses. There is little else. Once a steel magnate built a castle here. A love story, an extravagance of wealth and power, it burnt to the ground and now all that’s left is a beautiful ruin of a bygone era. But here — a black and white photograph. A gleaming dark horse in the foreground, feeding on tall grass, ribs visible, shining like oil. The crumbled white stones of a leftover fortress, a blurred background, unfocused. On September 11, 2016, on the day after his wedding, Neilson Hubbard took his new wife, pregnant with their son, to this desolate place. The photographs they took, and that island inspired the title to Hubbard’s first full release in 12 years, Cumberland Island. A phoenix, it thunders with the rumblings of resurrection. A gorgeous epic, Cumberland Island is a story of love rising from the ashes of grand dreams and lost promises. Neilson Hubbard knows the power of a cinematic landscape; he has been crafting his own sound as a songwriter and producer over the past 20 years. Originally from Jackson, Mississippi, he first gained acclaim as a singer and songwriter with Strays Don’t Sleep, a band he co-founded with artist Matthew Ryan. Over the course of the past decade, has become a highly respected and sought-after songwriter and producer, collaborating with Mary Gauthier, Caroline Spence, Ben Glover, Sam Baker and Amy Speace. A few years back, he and fellow musician/songwriter Joshua Britt, along with Ben Glover, formed the band Orphan Brigade. It began as a ghost chase: their first songs written and recorded almost literally in collaboration with a haunted octagonal pre-Civil War building in Kentucky. That project also birthed an award-winning documentary Hubbard and Britt made about the record, “Soundtrack to a Ghost Story”. The band’s second record was recorded in the 2500-year-old knights templar caves under Osimo, Italy and was released in 2017. Hubbard and Britt formed a kind of atelier called Neighborhoods Apart and have been producing videos and photography for John Prine, Jason Isbell, Tommy Emmanuel, Rodney Crowell, The Blind Boys of Alabama, Wild Ponies and others. From the opening title track, Cumberland Island cracks with immediacy and passion: the rush of an acoustic guitar, the steady crescendo of the bass, and a voice howling over the raging wind. Co-produced by Glover and Hubbard, they assembled their usual team of expert Nashville musicians (Will Kimbrough, Joshua Britt, Eamon McLoughlin, Dean Marold, Dan Mitchell). Recorded in only a few days, the record feels urgent, like the storming of a castle, the thunder of the horses. Included here are some of Hubbard’s best songs, previously recorded by his co-writers: “Save You” (Matthew Perryman Jones), “How Much Longer Can We Bend” (Glover). Those songs bookend the simplicity of songs like “Can’t Look Away”, “For My Love” and the timeless “My Heart Belongs To You,” which whispers through an off-kilter piano with a Waits-like intimacy. Taken together, the record seems to stand apart from time, a soundtrack to a daydream. The best stories demand pathos. Day needs night to fall. Love deepens with its loss. 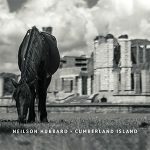 Neilson Hubbard’s Cumberland Island is an opera. It rages with vitality that is only earned by death’s reminding sneer, like the brutal wild horse on the album’s cover standing guard at a paradise once lost, now found again. I’ll follow to the end.